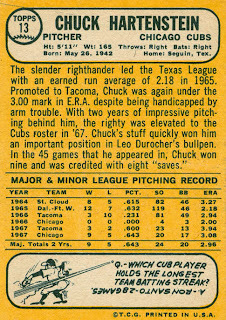 Chuck Hartenstein (nicknamed “Twiggy” because his slender build was similar to the British model of that era) was strictly a relief pitcher in the majors (mostly for the Cubs and Pirates). After leading his Texas Longhorns team to the College World Series in 1962 and 1963, Hartenstein was signed by the Cubs in 1964, and was a starting pitcher in their farm system in ’64 and ’65. In 1965 he posted a 12-7 record in double-A, and was called up to the Cubs in September. His only major-league appearance that season was as a pinch-runner on 9/11. 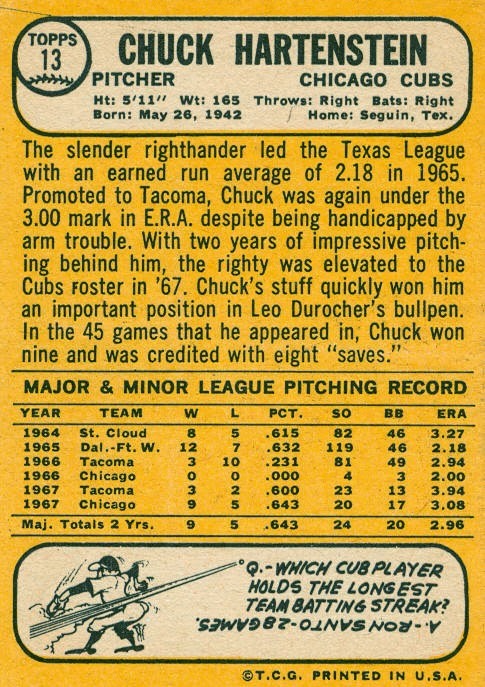 Chuck returned to the minors for 1966 and was converted to a reliever. He also appeared in 5 games for the Cubs during a September call-up. 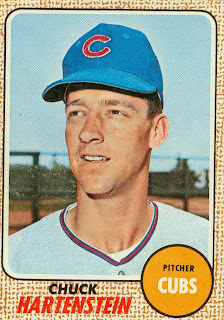 Hartenstein began the 1967 season in the minors, but was called up in early June, and pitched 73 innings over 45 games, while leading the Cubs ‘pen with 10 saves. 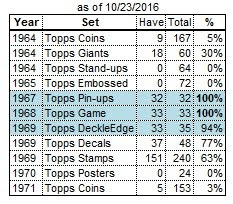 He was one of the few rookies in 1967 that did not appear in the 1967 Topps set. In April 1968, Phil Regan was acquired from the Dodgers to be the Cubs’ closer, and Hartenstein was pushed down to the #4 man in the bullpen, pitching only 35 innings, while also appearing in 20 games for triple-A Tacoma. After the ’68 season, Chuck was traded to the Pirates with infielder Ron Campbell for reserve outfielder Manny Jimenez (Wow, what a fall from his 1967 season!) 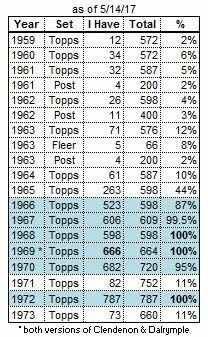 At least he stayed out of the minors in 1969, the first of 2 seasons that would occur during his 1964-77 professional career. Hartenstein led the Pirates’ with 10 saves in 1969, pitching 95 innings. Just like in Chicago, Chuck followed up a good season with a not-so-good season. By mid-June 1970, he was claimed off waivers by the Cardinals, who traded him to the Red Sox 3 weeks later. He also spent time in the Sox’ farm system that season. After the 1970 season, he was purchased by the White Sox, but was banished to the minor leagues from 1971-76, hopping from the White Sox to the Giants, to the Padres to the Blue Jays. Hartenstein resurfaced with the Blue Jays in 1977, appearing in 13 games from April thru late-July. His final game was a ninth-inning mop-up appearance in a 14-0 loss to the Rangers on 7/26. Hartenstein coached for the Indians in 1979 and the Brewers from 1987-89.